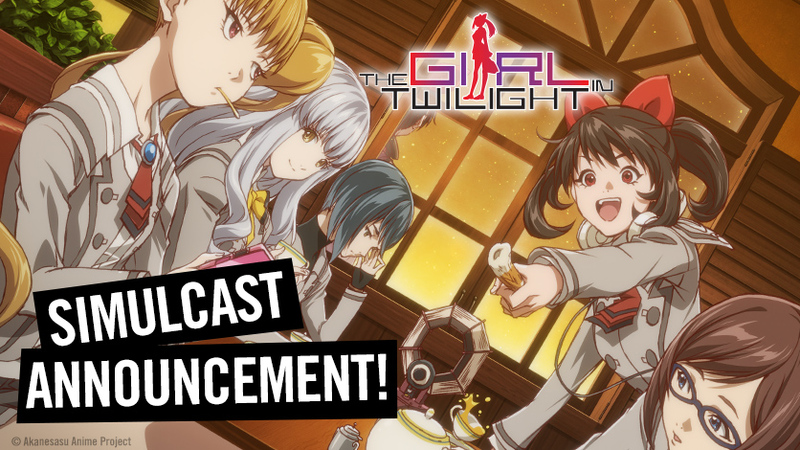 HOUSTON, TX, September 28, 2018 – HIDIVE announced today that it has acquired the simulcast streaming rights to the Fall 2018 sci-fi series, The Girl in Twilight for subscribers in the USA, Canada, UK, Ireland, Australia, New Zealand and other select territories. HIDIVE subscribers can watch the premiere on October 1, 11:30 UTC with new episodes releasing every Monday. Always on the lookout for a big adventure in her small town, the bright and kind-hearted Asuka Tsuchimiya is ready to explore new things with her friends from the high school’s Crystal Radio Club. One day, out of curiosity, the group performs a ritual from an urban myth that claims to open a portal to another world. Much to their surprise, the near-impossible conditions for the ritual to work were met, and they find themselves transported to a new dimension enveloped by hues of warm gold and jet black. If that wasn’t enough, they encounter a different version of Asuka whose motives are a mystery.